Greetings Earthlings and fellow crafters. LeeAnn here with my Friday post for Evaney's Stamp Designs. I had a bit of fun with this one. 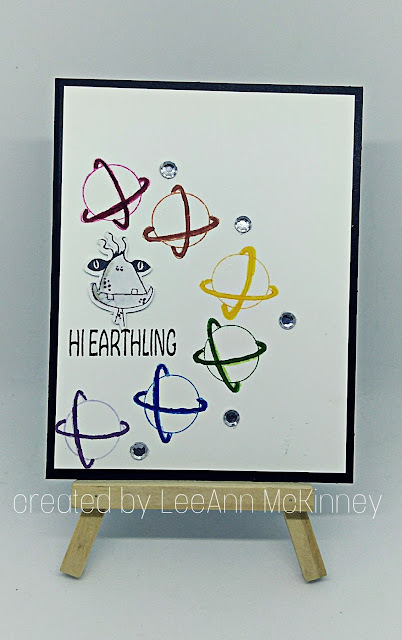 Using Memento Dew Drops in RoseBud, Tangelo, Dandelion, Bamboo Shoots, Danube Blue and Grape Jelly, I stamped the "Planet Stamp". I then used coordinating Memento Markers to color the rings of the planets in LadyBug, Potters Clay, Cantelope, New Sprout, Bahama Blue and Lilac Posies. I stamped the Sentiment and Cow Creature using Versafine Onyx Black, and colored cow creature using London Fog. A few rhinestones placed and my project for today was complete.